Activision has been a big, easy target for Critical Hit these last few weeks – I’d only just finished mourning the closure of Bizarre Creations when suddenly a wave of other announcements were let loose. In one fell swoop Activision ended the Guitar Hero, DJ Hero and True Crime franchises, then suspended Tony Hawk. Ouch! There is at least a silver lining to the untimely demise of Bizarre, however. Reports indicate that many of the 200 or so staff have been snapped up by former rival studios – let’s hope they manage to weave some Bizarre Creations magic into their new projects. Anyway, to stop this column becoming a fortnightly knock at the world’s largest games publishing house, I’m going to resist poking fun at Activision’s collapsing self-confidence and turn my attention to Nintendo’s 3DS. With the console launching on 25 March, the marketing drive is now starting to pick up steam. Display cases are appearing in retailers, the burgeoning price war among supermarkets and online stores is continuing, and the gaming press is drip feeding titbits of information and previews on a regular basis. As the use of 3D in the movie industry continues to have its critics and plaudits alike, it’s easy to perhaps fall into the ‘3D-as-a-novelty’ mindset regarding the upcoming console, especially as stereoscopic 3D hasn’t exactly captured the imagination of home console gamers just yet. However, Nintendo has something of a record in disrupting the games industry, having turned cynics around to the virtues of a dual-screened handheld in 2004 with the original DS, and with the ground-breaking use of accelerometers and motion control with the Wii in 2006. Despite this, though, I was still something of a fence-sitter before a recent encounter with the 3DS. I had a number of unanswered questions, not least whether the glasses-free, parallax barrier 3D technology used in the console works as well as the glasses-equipped 3D systems used in cinema multiplexes. I was still cynical about whether the 3DS was anything more than a gimmick. However, after holding one and playing a couple of the launch titles, I have to admit that I've seen the light – and now can’t wait to get hold of one myself. I’m not getting caught up in the pre-launch hype, though; far from it. The initial batch of titles shipping the same day as the new platform look great, especially the likes of Resident Evil: Mercenaries 3D and Super Street Fighter IV 3D, but I’ll be more interested to see how developers take advantage of the system's 3D technology to really deliver a new experience for gamers. After all, the original DS did so much to expand the portable gaming scene, offering some truly unique games from the start, although perhaps the likes of Asphalt Urban GT can be left off the list! Novelty features such as the in-built 3D camera aren't perhaps going to set the world alight by themselves, but once you couple them with the device’s accelerometer and Augmented Reality capabilities you can see the potential for a whole new trend of gaming innovation. Of course, 2011 will also see the launch of Sony’s NGP handheld, which promises to deliver its own brand of technological innovation and gaming immersion. We’re already seeing hyperbole, with visuals said to be on par with the current crop of home consoles. That won’t be enough for Sony to topple Nintendo in the handheld stakes, however. After all, the old PSP still lost out to the technically lesser DS, and it's also worth considering the immense amount of competition from iPhones and Android smartphones this time around. At the very least, the combined might of Nintendo and Sony’s new consoles may be enough to turn back the tide of under-priced and under-par ‘treats’ available from App Stores and Marketplaces. Here’s hoping, at least. Sony has unveiled the price and rough release date for the Vita at E3 2011. 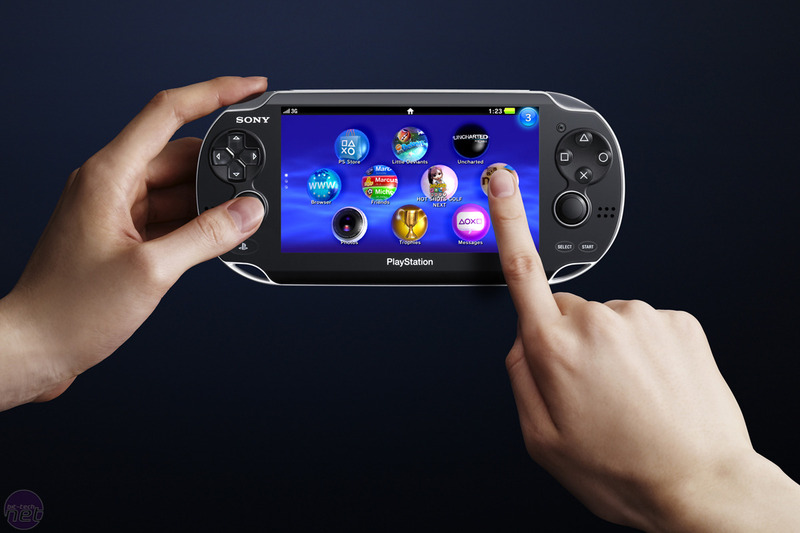 Sony has unveiled some of the plans for the PlayStation Vita, formerly known as NGP.